I’ve done significant amounts of exploration and questing in three Outland zones now — Hellfire Peninsula, Zangarmarsh, and Terokkar Forest — and so I think it’s time to post some more possibly-misguided generalizations about what Outland is like and how it differs from Azeroth. One way the zones of Outland emphasize that you’re not at home: color. A lot of zones in Azeroth use color themes and ambient light to suggest the quality of the atmosphere, making everything redder where the sun is fierce, or greyer where the ruins are foggy and desolate. Transitioning between zones with extreme color differences, you can actually watch the sky change. 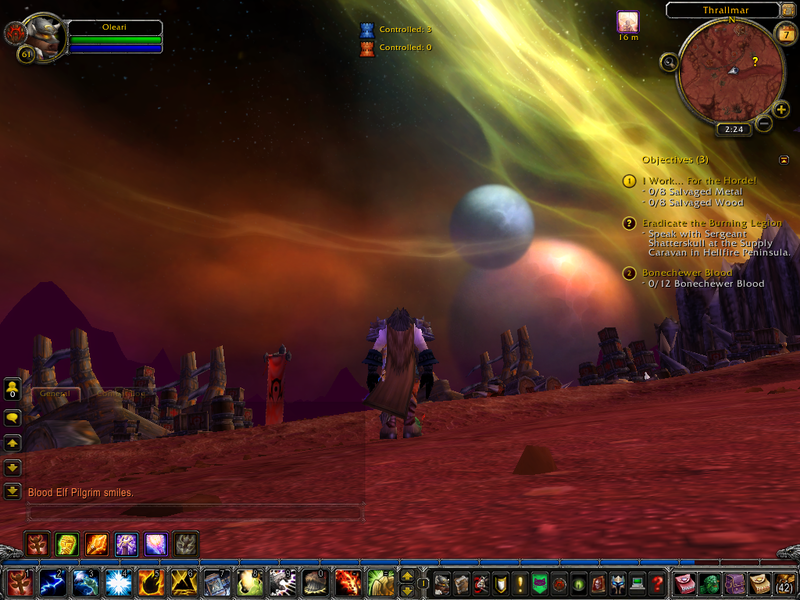 But none of the color schemes I’ve seen in Azeroth are as extreme as what I’ve seen in Outland. Zangarmarsh in particular is absurdly blue. Outland, also known as Draenor, is the home of the Draeni, the first playable race in the game that isn’t either Tolkien-standard or animal-based. (I find them a little reminiscent of Githzerai, but I think that’s mostly because of their role in the story.) Blue of skin and blank of eye, they look a little bit Orcish and a little bit Elvish, but with the less human aspects exaggerated. The beards on the males turn out on closer inspection to be some sort of facial tentacles, and their cloven hooves remind us that they’re ultimately of the same stock as the so-called demons that lead the Burning Crusade. Speaking of demons, remember how Warlock characters get to summon demons to fight for them? There are various sorts of summonable, including both traditional sorts like imps and succubi and less familiar things like the cloud-like Voidwalker and the weirdly spiky Felguard. In a nice touch, you can see all of these creatures roaming free for the first time in the Hellfire Peninsula. Voidwalkers don’t even seem to be affiliated with the Burning Crusade at all; they just roam the more dimensionally-unstable places going about their own business. In short, despite being definitely in the fantasy genre, it’s still an alien planet, with alien life forms. The fact that Draeni tend to wear robes and carry swords does not change the fact that they are basically kind of sci-fi. (It’s kind of like the Marvel Comics version of Asgard sometimes.) Some of Azeroth’s monsters are pretty alien too, mind you — there are buglike creatures called Silithid that are pretty plainly modeled after the Zerg from Starcraft. But in Outland, even the plants are a bit otherworldly. The trees of Terokkar are tufted and spiky and twisted, not quite like anything on Earth. The ones in Zangarmarsh are actually enormous mushrooms, with caps large enough to land a flying mount on. One side effect of getting hacked seems to be that I lost my guild membership. Presumably this happened as a result of Oleari being deleted. At first, my reaction was that I had to get back in. I mean, I was almost halfway to raising my guild reputation from Neutral to Friendly! And that took a very long time, due to my inability to participate in guild activities. Guild rep works more or less like any NPC faction reputation, which is to say, it’s completely automatic and has nothing to do with what your guildmates actually think of you. Nonetheless, it’s significant: to some extent, it governs perk access. There are special tabards you can wear that increase the rate at which you gain guild rep, but your rep has to already be at least Friendly for you to buy them, a sort of semi-permeable catch 22. There was some evidence that I still had my accumulated guild rep in some kind of dormant state, and could recover it by rejoining. But in order to rejoin, I would have to contact someone in the guild, and the only person in it I actually know had been inactive for over a month. Which in itself was perhaps a sign to let it go. There’s also the fact that the guild had reached its level cap. I think I mentioned guild levels once before. They’re a concept that came in with Cataclysm. Various activities, including just completing quests, give experience to the guild as a whole. As a guild levels up, its members get perks like increased riding speed and diminished wear-and-tear on equipment and the like. Some of the perks help members gain reputations faster, but it’s not clear to me if this applies to reputation with the guild itself. I suppose that a powergamer would want to be in a level 25 guild all the time in order to have all the perks, but to me, the whole point of having a system of levels is to level up. I actually felt a little cheated when I logged on after three months and found that my guild had managed to reach level 25 without me. There’s no sense of accomplishment in reaping the benefits of what other people have done. So clearly, if I was going to be in a guild again (and really, it’s something of a waste to not be in one), it was going to have to be a new, small one that I could actively participate in growing. Finding a guild to join is not hard. The mere fact that Oleari was nearly level 70 and not in a guild meant that she was getting frequent invitations from strangers. (Possibly the fact that she’s a healer helped.) But I wanted to make sure I was joining a guild where I could make a difference. Fortunately, there’s a newish built-in tool for this: the Guild Finder. I had never seen this before, because it was added after I joined my previous guild. The button for it sits in the same slot that, when you’re in a guild, brings up the guild details. It’s not really adequately documented: the list of actively-recuiting guilds lists a few numbers without explaining what they mean. One was clearly the guild level (as it never rose above 25), and another seemed to be the membership count, but the third took me a while to puzzle out: it’s the number of guild Achievement points it has. Achievements are another area where getting them is more appealing to me than already having them, so I wanted to find guilds with low level and Achievement points, but more than just a couple of members: I don’t want it to fizzle out underneath me. Finding such a thing could have been made simpler with a better UI, one capable of sorting by different fields, like a Windows directory listing, but no, the UI designer here decided to go with pretty rather than functional. But I did find a few, and even got a reply from one, a new one that had just been created the day before. We’ll see how it goes. The membership was about 20 strong when I last checked, and an encouragingly large fraction of them were below level 85. So, one of the responses to my post about my WoW account getting hacked suggested getting an “Authenticator”. I remember seeing these devices in the Blizzard store, and basically dismissing them as akin to the identity-theft protection plans sold by credit card companies: an attempt to scare you into paying extra money for something that’s really supposed to be part of the vendor’s job anyway. But this impression was, it turns out, way off. For one thing, you can get an Authenticator free of charge. Blizzard will sell you a hardware device if you need it, a little LCD-display device that fits on a keychain, but they also provide a free app for various mobile platforms (including, but not limited to, iOS and Android), as well as an option to do your authentication through a toll-free telephone number. Basically, they just want you to use an Authenticator of some sort, and try to make it as accessible as possible. In fact, they go so far as to give a special thank-you in the form of a vanity pet — a “core hound pup” — to anyone who links an Authenticator of any kind to their account. As chance would have it, I had exactly 14 pets before I set up my Authenticator, and there’s an Achievement for acquiring 15. So already I think it’s worth the time it took to download the app. And what does an Authenticator do? It generates eight-digit numbers, which are then required to log onto your account, both in the game and on the web. These numbers are apparently only good for 30 seconds — at least, that’s how often the mobile app version spits out a fresh one. When I saw how it all worked, my first reaction was that there should really be some way to link the authentication to a particular machine instead, like Steam can do, so that you don’t have this extra step every time you log in. But apparently it does that too: once the server recognizes that you log in consistently from the same machine, it stops asking for the Authenticator code there. And, having wished for that, I now hope that there’s a way to stop it if necessary. Now, there can only be one Authenticator paired with an account at a time. This seems reasonable to me: if there were a way to register a second Authenticator, you wouldn’t be able to be sure that no one else can access your account. But it does raise an issue: if you don’t have an authenticator, the attackers can link your account to an Authenticator of their own, thereby locking you out. Mind you, they’d have to also have access to your email in order to confirm the link, but that’s a possibility: if they can get access to your Battle.net password, there’s a reasonable chance that they can get your email password as well (especially if they’re the same). And being locked out would make it difficult to submit a support ticket, or even to cancel your subscription. So to that extent, the existence of Authenticators actually makes things a little less secure for the people who don’t have them. I’d complain about this if there were any good reason not to have an Authenticator, but as far as I can tell, there isn’t. The only downside is the extra step in the login process, and that’s nothing next to the worry and inconvenience of being hacked, even if (as in my case) it’s a temporary condition. I don’t really like the fact that an Authenticator is a must-have, but that’s genuinely the way it is. I only wish someone had convinced me of this sooner. Today, before heading back to Outland, I tried out something that has been on my WoW to-do list for some time: the weekly fishing contest in Stranglethorn Vale. This is an activity that’s thrust before your face as soon as you get your first point in fishing skill, by NPCs handing out flyers in Orgrimmar (and presumably in the Alliance capital as well), but what chance does a rank amateur have of winning? My fishing skill is over 300 now, close to the maximum I can get before buying more expansions, so it seemed worth at least trying out. Mind you, people who have Cataclysm can get a fishing skill over 500, but I figured that at this late date most such people had won the contest before, and gotten bored with it, and quit. Which may in fact be the case, for all I know, but the competition isn’t abandoned. I saw maybe four other people fishing, and there were probably a few others that I didn’t see. The competition was won in less than a half an hour, and at that point I was only about halfway to the goal. The way the derby works is this: At 2:00 PM every Sunday, schools of Speckled Tastyfish suddenly appear all along the Stranglethorn coast. Schools of fish are a mechanic seen wherever there’s fishable water: they’re spots where some particular sort of fish is much more likely to be caught, visible as a circular ripple on the surface of the water. You can even make schools show up on your mini-map if you want. After a certain number of fish have been pulled out of a school, it fades away. (There are also pools of debris in some places that look similar to schools, but with bits of board and crates floating in them. Fishing in one of these yields strongboxes and other salvage.) Speckled Tastyfish are a special sort of fish that can only be caught during the derby, and apparently they disappear a few hours after being caught, so you can’t stockpile them for next week. The first person to turn in 40 of them wins the prize: a special fishing item, the title of “Master Angler”, and an Achievement. Apparently there are a few kinds of rare fish that can also only be caught in Tastyfish schools, and which can be turned in for their own special rewards regardless of whether you win. This strikes me as a clever bit of design: it gives people a motivation to try their luck even if they have no chance of winning. And that’s before we get to the one really decisive factor that I wasn’t anticipating, but probably should have been: violence. On a PVP server, violence really is all-pervasive wherever Horde and Alliance players mingle, and a nice friendly fishing competition is no exception. If you’re level 85, and you see a sub-70 enemy near a Tastyfish school you want, you better believe you’re going to take a half a second out of your busy fishing schedule to kill them. It’s absurd, but that’s how little life means when everyone just respawns at the nearest graveyard. So, here we are at the end of my 6-month subscription. Despite my badmouthing the game in these posts, I’ve basically been thinking for the last few days that my desire to see more of WoW‘s content, including the rest of Outland, was strong enough that I actually would be extending my subscription after all — making this, all told, the most expensive game I’ve played in years — and presumably, in due course, get the remaining expansions. What I do when I hit the level cap, I don’t know. It depends somewhat on whether there’s a new expansion out yet by then, and also on whether it looks like the game’s decline in membership is continuing. (I suppose I’m one of the few people who would be more likely to keep the subscription if it is. I kind of regret not being there at the end of A Tale in the Desert‘s first telling, and being on hand at the fall of another MMO, especially an epochal one like WoW, is not something I’d pass up.) In last night’s session, I even bought some new high-capacity luggage at auction (including a 36-slot fishing box), in expectation of great things to come. That much was demoralizing, but not catastrophic. Blizzard’s abuse team at least understands that one day of spam after six months of good behavior is likely a hack job and doesn’t really hold it against you; the three-hour lockout was as much for my own protection as to keep the chat spam-free. Unfortunately, it seemed to have come too late. When I logged on, Oleari was missing. The only character on her server was a level-1 Human priest. Oleari, gone? Without her, there wasn’t much point in continuing. I really don’t feel like starting over from scratch (or even from level 27, the highest level of my other characters). The really enraging thing about this wasn’t the loss of wealth and equipment, mind you. I can understand stealing a character’s stuff. I once got hacked and looted in Kingdom of Loathing, but the most valuable things there are unlootable — character experience, permanent skills — and to some extent, the same applies here. Oleari’s an herbalist; she could rebuild her material fortune pretty quickly by selling Outland herbs at auction. (Most of her 1000+ gold was acquired this way in the last two weeks, and that’s after buying a bunch of expensive bags.) But she can only do this if she exists. No, the enraging thing was that scrapping the character herself seemed so pointless. How did it benefit anyone? It just seemed like a sign that we live in a bad world, where people do bad things to each other for no reason. I actually think I have a better explanation now: it turns out that the hacker created a great many characters on different servers, all Human. Perhaps the spammer deleted Oleari in order to keep within the limit on the number of characters per account. At any rate, my thoughts were basically that I don’t need to play a game where this sort of thing happens. And so I removed my payment information from the account, giving Blizzard no way to charge me further. But then they impressed me with their responsiveness to my support ticket: despite an estimated 48 hour turnaround (by which point my subscription would have expired), they restored Oleari and all her belongings in just over 12. I can’t think of another online game I’ve played where loss due to hackage has been rectified so swiftly and thoroughly; my usual experience is that what’s done is done and the GMs either can’t or don’t like to undo anything. But WoW is a class act. I suppose the fact that Oleari was simply deleted rather than looted makes it simpler, but still, they deserve some kudos for making wrongfully-deleted characters so easily recoverable. So, I’m inclined at this point to write this off as just another crucial part of the WoW experience, something that my journeys through Azeroth and Outland would be incomplete without, and keep going. But I was kind of looking forward to putting it behind me and throwing myself into a different game tonight. Maybe I’ll take another break soon. Well, level 70 shouldn’t be that far off. One immediately noticeable change to the capital cities happened during my time away from Azeroth: more of them have their own Fishing and Cooking daily quests. In addition to Orgrimmar, Thunder Bluff (the Tauren capital) and apparently the Undercity (Undead capital) now have them, and each of these cities has its own Achievement for doing them. Apparently the the same has happened on the Alliance cities. I’m close to getting the Fishing one for Thunder Bluff, which is easy for me to go to: despite all my roaming, I still keep it as Oleari’s designated “home base”, the place that I can teleport back to by using my “hearthstone”. It would seem almost traitorous to change that now. I’m less close to the one for Cooking, not because I’ve been doing it less often, but because the random number generator seems to always pick the same one: a quest to grind bowls of corn located in various buildings. Like most of these quests, it’s just a little window dressing on the task of finding the sparkly things to click, but the fact that the bowls are all behind walls gives it a slight hide-and-seek aspect. The cooking and fishing dailies in Thunder Bluff are basically similar to the ones in Orgrimmar, but I’m finding them a lot quicker to complete. The reason: lack of competition. When the chef in Orgrimmar sent me to collect cactus pears, I’d have to run around the whole city trying to spot a cactus that was ready to be harvested before anyone else noticed it. In Thunder Bluff, I’m generally the only person doing the quests. Well, Thunder Bluff has always been a less crowded place, something of a backwater really, whereas Orgrimmar is the capital of the entire Horde side, the central point that all zeppelin routes converge to, and sometimes crowded enough to seriously interfere with graphics performance. Probably most Horde players set their home base there when they don’t have a compelling reason to do otherwise. But then, perhaps there’s less competition in Orgrimmar as well, now that the people looking to do cooking and fishing dailies have a choice of three places to do them, and now that the real die-hards have maxed out and cooked everything, and now that the player base is definitely shrinking. Blizzard recently reported a reduction in the number of subscribers for the first time, from 12 million to a mere 11 million, the poor dears. I suppose it’s the beginning of the end. So, I decided on a whim to leave Outland for a while and do some more questing back in Azeroth. I picked the desert province of Tanaris for no better reason than that I hadn’t been there yet and it was right next to Thousand Needles, the last zone I had completed. By pure coincidence, it turns out that Tanaris contains the entrance to a Burning Crusade dungeon that I was an appropriate level to attempt. This is unusual. I don’t usually access dungeons through their entrances. The Dungeon Finder makes it unnecessary. I’ve been through all of the dungeons available without expansions, and for many of them, I still have no idea what zone they’re in or what the motivating context is supposed to be. For me, the motivation was usually that I was about to become too high-level to access that dungeon through the Dungeon Finder. Perhaps this is part of why I’ve always found it difficult to get up to speed about what I’m supposed to be doing in them (although mostly that’s just because most of the people in the average pick-up group have done the dungeons before and go running off without bothering to read the quest descriptions). Here, though, not only did I actually get the context, but the context seemed important, because it was an unusual dungeon. For one thing, it was outdoors. That’s not unprecedented — heck, it’s not even the only open-air dungeon in Tanaris. More importantly, it’s set in the past. The whole thing is set in a modified copy of the Hillsbrad zone, accessible through a magical cave, a special place where stresses on history manifest. There’s a whole order of temporal guardians living down there, willing to give a tour to any adventurers who can help them iron out their enemies’ attempts at altering history. Old Hillsbrad isn’t the only time and place where this battle is being waged, but it’s the only one accessible to me at the moment. The attempted revision involves an orcish slave named Thrall. At the time of The Burning Crusade, Thrall is leader of the Horde, and the path to that starts here, with his escape. This is therefore one of those moments when a great deal of history hinges on a single action, and is thus vulnerable to meddling. Now, Thrall isn’t the leader of the Horde any more: as of Cataclysm, he’s been replaced with Garrosh Hellscream. But over in Outland, which hasn’t been revised, Thrall is still in charge. There’s a lot of that sort of thing going on, really. Different places, in a sense, occur at specific points in the ongoing storylines. It used to be that taking the expansions in order would give you events in order, but Cataclysm messed that up by changing the core zones back on the original continents, giving them a new plot set in the aftermath of Wrath of the Lich King. Even within a single zone, time can get messed up, as when you talk to an NPC before you’re instructed to, and then later when you approach him in-sequence he greets you as if for the first time. There’s a whole series of events back in Silverpine Forest involving an Undead NPC named Lord Godfrey: he gets raised as Undead, accompanies you on some quests, and ultimately turns traitor and flees to a dungeon called Shadowfang Keep, where he’s the end boss. I saw the last part of that first. Confusion ensued. What I’m getting at is that there are really time portals all over the place. The only thing unusual about the Cave is that they’re openly acknowledged by NPCs. Playing as Horde makes helping Thrall a natural thing to do, but apparently the premise and quests are the same regardless of which team you’re on: keeping the timeline sound is an overriding concern for everyone except omnicidal madmen. This must be one of the few points in the game where Alliance players get to see things from the Horde point of view, see the future Horde leader as a proud and honorable ally suffering injustice at the hands of sneering, overbearing humans. Horde players get a taste of how the other half lives, too: they spend the entire mission shape-shifted into humans so they can infiltrate the place, and if you wander off-course enough, you can talk to peaceful human villagers, and listen in on their private conversations. Come to think of it, this reversal of perspective works well into Burning Crusade‘s overall themes. As I mentioned before, the premise of the expansion involves Horde and Alliance putting aside their differences to deal with a demon invasion. Ironic, then, that I’ve been attacked by Alliance players more often in Outland than anywhere else. So clearly, I’m finding this game compelling. (Which, remember, is a quality that’s orthogonal to fun, and not necessarily a good thing in itself.) It’s compelling enough that the moment I start playing, the rest of the day is lost. But this is a little strange, because the usual cited reason that people feel compelled to play WoW is the social component — that is, the same sort of reinforcement as is behind Facebook games, but with the added snare that your guildmates are counting on you to show up at appointed times and do your part in dungeons and raids. But that really doesn’t apply to me. The few people on my WoW friends list last logged on between a month and five months ago. And although I am technically a member of a guild, I was never able to participate in guild activities, due to not having a level 85 character. The only way I ever participated in the guild was via its chat channel, and that’s pretty much dead these days, now that all the old regulars are bored with Cataclysm. I suppose what it comes down to is this: the WoW phenomenon is not as simple as many claim. It has more than one avenue into the psyche, more than one way of getting people hooked. If you’re antisocial, it loses one of its big draws, but it can still take advantage of your compulsiveness. Let me describe one particular quest in the Outland. It’s a quest that I finished today, but only because I was prevented from completing it yesterday due to the inaction of Alliance players. In the middle of the Hellfire Peninsula, there are three points arbitrarily designated as places of great strategic importance. Apparently they were one of the developers’ first experiments with putting PVP mechanics into the main map, rather than isolating them in Battleground zones. Like the capture points in Battlegrounds, each of these can belong to either Horde or Alliance, or be neutral. If you stand in one that’s owned by the enemy, and there’s no enemy there to oppose you, it gets slowly converted to your side: a gauge in the quest UI shows your progress towards converting it, and flags draped about the walls show the current winner’s colors. There is a repeatable quest to participate in capturing all three points (not necessarily all at once). Note that there’s one condition that definitively prevents you from accomplishing this: if one or more of the points is already under your side’s control, you cannot capture it. The premise of the quest is that it’s crucial to control those three points, but simply controlling them isn’t enough to earn your reward. You have to take control of them, even if it means letting the enemy capture them first. (It reminds me of certain Catholic doctrines about sin.) I imagine that when Outland was first opened to visitors, and the zone was flooded with level-60 players, ownership of the capture points must have flipped pretty frequently, making their recapture a convincingly urgent concern. But there aren’t a lot of people in the zone these days, so they can get stuck in one state for a good long while. And that has interesting and presumably unintended consequences for player behavior. During my first sally at this quest, I found an Alliance member capturing one of the points while two Horde guys hovered overhead on their flying mounts. When I made to land, they asked me not to: they were politely waiting their turn, waiting for the Alliance guy to finish capturing it so they could capture it back. There was no combat here, just polite cooperation that allowed both sides to fulfill their needs. In another game, I might regard this as tantamount to cheating, like using a TF2 “Achievement server” 1Achievement servers are places where people go to collaborate on fulfilling the requirements for TF2 Achievements instead of actually trying to win matches. I think it’s a good thing that they exist, because it keeps that sort of behavior out of the regular servers, but it’s always seemed to me a way to make the game less fun. , but here, it just seemed like a natural and unavoidable consequence of a badly-thought-out mechanic. In fact, my thoughts on this matter were so firm that I was fairly flabbergasted when I came back the next day and found that someone in the Alliance was actually defending the things. Someone, moreover, powerful enough to kill me in one hit, and therefore probably not getting any Honor points for it. I kept coming back, hoping that he’d get bored of killing me eventually, and eventually it worked. But I was surprised at his persistence. He was probably surprised at mine, too, but at least he presumably understood my motivations, and I don’t understand his. Was he just in a bullying mood, or was he taking the fiction more seriously than I was? 1. ↑ Achievement servers are places where people go to collaborate on fulfilling the requirements for TF2 Achievements instead of actually trying to win matches. I think it’s a good thing that they exist, because it keeps that sort of behavior out of the regular servers, but it’s always seemed to me a way to make the game less fun. As I think I’ve indicated, I didn’t know the premise of The Burning Crusade before starting it, other than that it involved a world called Outland. Even within the game, information is skimpy. As I’ve observed before, NPCs in the game just kind of assume that you know what they’re talking about, confident perhaps that you can consult a wiki to fill in the gaps. I honestly don’t remember even receiving the quest to go to Outland. It just sort of showed up on my quest list. It turns out that the portal to Outland is the very same Dark Portal that brought the Orcs to Azeroth back in the backstory of the original Warcraft. The Burning Crusade is not, as I had assumed, some war initiative of the Alliance, but a term for the multiverse-conquering demons that started pouring through the Dark Portal when it reopened. This is a big enough threat to make Horde and Alliance put aside their differences in order to guard the Portal and keep the demons at bay. The encampment circling it, neatly divided into Horde and Alliance by a line running down the middle, gives me a distinct cold war vibe, heavily militarized tension and waiting. This is the sort of truce that forms when the saucers land. And, true to that image, Outland (or at least the near part of it) looks like an alien planet off a sci-fi paperback: a reddish desert with a sky full of rings and planetoids. Here I can finally use my flying mount. It’s the same sort of lion-headed “wyvern” that you can hire to fly along fixed routes back in Azeroth: a bizarre-looking creature, but it fits in perfectly here, flying past the multiple moons of Outland. Outland is a small world, with only seven zones, compared to the 30-odd in each of the original continents. But these zones seem to be very dense with quests. Remember that there’s an Achievement for completing a certain number of quests in each zone — a number slightly lower than the number of quests available. For most zones I’ve seen, this number is in the neighborhood of fifty. There’s one zone here for which it’s 120. And what are these quests like? I’m finding them gruelling. The tasks are the typical sort of WoW quest, but in the process of pursuing them, I keep getting attacked along the way by groups of monsters that take so long to kill that some of them actually respawn before I’m done with the fight. I’m avoiding as many fights as I can by flying, but you have to land and do your quest sometime. Also, it doesn’t help that a gnomish paladin kept killing me when I was in the middle of such fights (ironically getting “honor points” for doing so). Once again, I marvel at how the game mechanics are designed to convince us that the opposite team is composed entirely of jerks. Speaking of which, it seems like this is one place where the perspectives of the two sides must be very different. To the Alliance, Outland is purely and simply the place where monsters come from, whether demons or orcs. To the Horde, it’s the ancestral homeland. The orcs have come here, not just to stop the demons, but to try to uncover their own lost history. So I’m once again glad that I’m playing Horde, because that seems like a more interesting story to me.